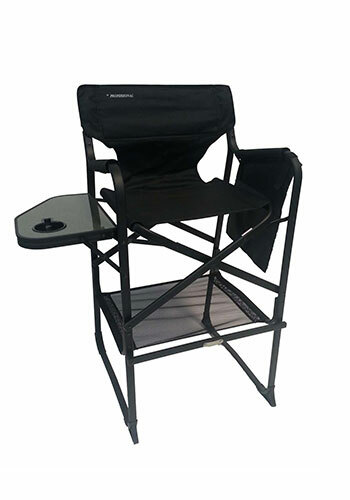 The ORIGINAL PROFESSIONAL Economy ” Tuscany Pro” Lightweight Premium Tall Folding Directors Chair with its innovative Design uses Black Anodized Flat Reinforced Aluminum Tubing, which gives an interesting look. It is classy enough for use inside the Home or Patio, and rugged enough for any outdoor activity. The fabric is made with Black 630D Polyester Fabric, and is Washable and Mildew Resistant. SGS Lab tested for tipping using foot pad stabilizers as a standard feature, it has a Side Table with Cup Holder, Side Storage Bag, Storage Net, and Storage Pouch on the backrest. Tall Directors Chairs have always been a great place to Relax. The best feature is its Durability! Perfect for any Trade Shows, Makeup Artists, Face Painting, and much more. 45″ L x 24″ W x 6″ H and 14 lbs. 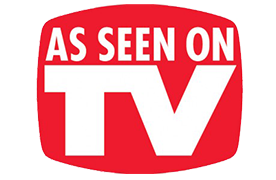 45″ H x 24″ W x 18″ D and 13lbs. 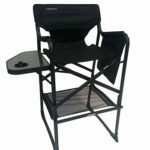 Add professional makeup artist chair with innovative style to your chart. These chairs have strong-built aluminium frame and cushioned seats for comforts. Easy to store, fold and travel these chairs have many other classic features. Foot and arm rests are the standard characteristics of these chairs, especially made keeping the ease of the customers in mind. These chairs are also accompanied by leg stabilizers for height adjustments which are made quite appropriate to attend every customers. There will be no more complains from the side of your visitors. 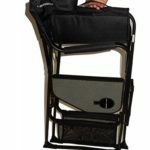 The convenient storage pouch, brush holders and attached tray are the extra advantages that these chairs bring with them. The fact is, these additional edges have made the artist job much easier. These fashionable makeup artist chairs are really constructed for professional use. It not only makes the job simpler but also gives great pleasure to the daily visitors of your salon. 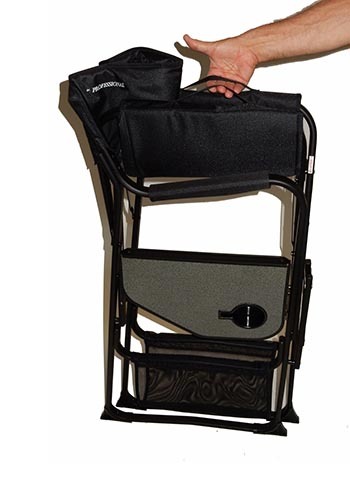 High durability and firmness make this portable makeup chairs beneficial to users.